Abdoul Gueye; his wife, Cassandra Gueye, and their daughter, Sonia, outside Abistro. For the uninitiated, Abistro is easy to miss. There are no signs outside the African bistro on the corner of Carlton and Myrtle Avenue, just a white storefront and a lining of thick drapes in the winter months that block any sign of what is going on inside. Still, if you don’t live in Fort Greene and have no clue to the popularity of this restaurant, you might figure out that something is going on there by the crowds on the sidewalks around dinner time on weekends. Listen at left to Abdoul Gueye lay out his stealth marketing strategy for Abistro, including the no-sign thing. The couple took a risk in opening the restaurant. Back then, Myrtle Avenue was still trying to shake off its reputation as Murder Avenue. There had been regular volleys of gunshots on the corner and marijuana sales were thriving. And the storefront space they decided to take over had not been used in years. Rumor has it that it was once a liquor store, but in 2004 it was a place for the squatters to down beer and play dominoes. Mr. Gueye had wanted to open a nice restaurant in Fort Greene for years, and something about this hole-in-the-wall kept tugging at him. Abdoul Gueye is Senegalese, but was born in Cote D’Ivoire and educated in France. A trained electrician, he’s been cooking since age 14. He left Africa for New York in 1989. In the late 90s, he and Cassandra, who were not yet married, settled in Fort Greene. Mr. Gueye said he decided he did not want to be the kind of immigrant that associated only with other immigrants. From there, he went to work, cooking for years at some of Manhattan’s finest white-table cloth establishments: La Goulue, Aureole, Aquagrill and others, rising from line-cook to top chef and testing recipes along the way. 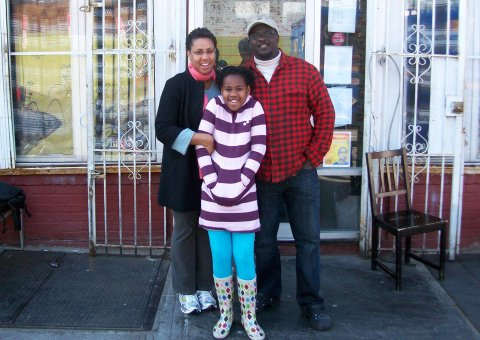 By 2004, Mr. Gueye had secured a 10-year lease to the space on Carlton and Myrtle, and with his wife and their daughter, Sonia, began cleaning it out. It was a family project and by the time the bistro opened, Mr. Gueye was in the kitchen, Ms. Gueye out front welcoming and serving, and Sonia was mingling with the diners. The dishes that brought Fort Greeners and Clinton Hill hipsters and their friends, family and neighbors back include the Senegalese fried chicken ($15); the Darkaroise roasted trout with jalapeño ($16); the Moroccan salmon with peanut palm sauce ($22), and tofu with soba noodles ($15). Mr. Gueye described his cuisine as universal. “You travel with my food. You can travel from Africa, to Europe, to America, to Asia. And at the same time you’re comfortable with what you’re eating,” he said. Anika Penn, 31, a graduate student in international relations at John Hopkins who is from Fort Greene, said she has been dragging friends to Abistro since her first meal. Mr. Gueye’s food is well executed and adventurous, she said. The New York Times recently included a bistro in a round-up of African restaurants and declared the hamburger ‘first rate.’ The review also called for Mr. Gueye to bottle his secret sauces.